It has been an amazing experience so far much more exciting and educational than I ever imagined. I have learned so much from knowing next to nothing about our native sea live in the rockpools from now having read several books, having seen and identified many new to me species and having had the joy to see some of them really thrive in my own artificial habitat. There has been many ups and downs, there has been death and birth and many a time have I witnessed the dog-eat-dog world that live in rockpools hosts. Yet it is truly fascinating and I will never forget the jaw dropping moments of discoveries and finds of all this mysterious beauty and events. Back to beginnings here a picture from the early starts in November 2013 and below one from now. Obviously doesnt look as clean as the beginning but nice to see that some of the previously barren rocks are now hosting a few seaweeds. There has been some serious plaguing with cyanobacteria and epiphytes overgrowing seaweeds, rocks and some poor old snails. I suppose this is fairly normal and to be expect as even in real rockpools seaweeds have to battle with strong epiphyte growths especially throughout the summer. If I had the time I could probably do better in the fight against them with additives and certain filter media that would remove phosphates quicker as they could consume them. But I like to keep it simple and as natural as possible. I have however been experimenting with a “Macro Algea Fertiliser” called SeaGreen from Waterlife. I think it is helping the Brown Fan weed that is growing well since, however its hard to tell does it have to do with the reduced daylight and/or temperature. Water values have been perfect since the addition of the live rock to the sump a good few months ago. Ammonia, Nitrite, Nitrate and Phosphate all zero. I want to try and get the nitrates up a bit to hopefully improve macroalgea growth by feeding more often with blended shellfish etc. but thats only a plan so far. The last batch I made went bad when I had the power outage and the freezer unthawed. The equipment I have been using over the year is all working perfectly. Really happy with everything. Might update the Technical Setup page with some reviews on those. 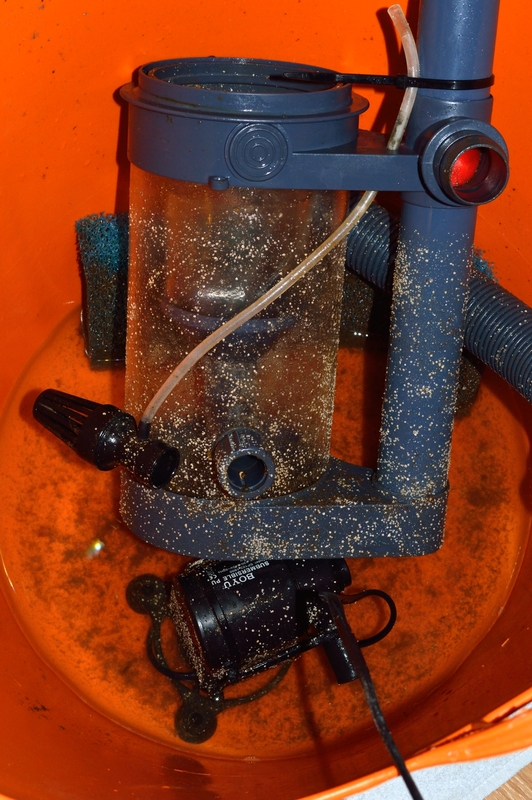 Especially the Boyu Skimmer that only cost around 60 euro and therefore was a bit a question mark is still working perfectly and removing nice very dense dark brown/green scum. It has been completely invaded by tiny tube worms as well as many other areas in the sump and aquarium where not much light reaches. 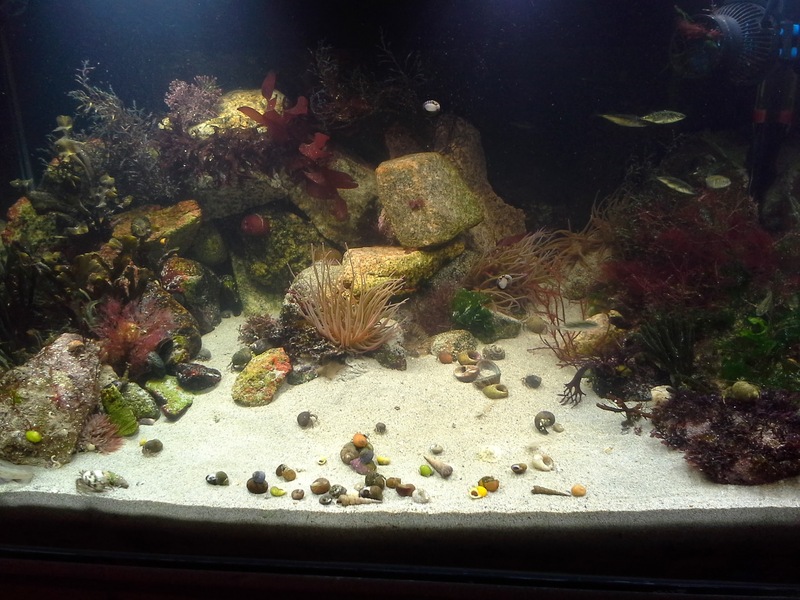 Its in my opinion one of the the most amazing things with a marine aquarium when you see flora and fauna appearing like this just through the addition of natural sand, rocks or water. All in all I would say the project is a success with its ups and downs and I am looking forward to lots more discoveries and to learning more about our absolutely fascinating and beautiful native marine world! October 27, 2014 in 200l Main tank. Congratulations, and keep it up.